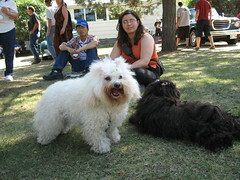 Here is Josie and Caillee resting in the shade at the Corn & Apple Festival in Mordon Manitoba, Canada. Behind us is some cars at the car & motorcycle show there. I picked up some pretty jackets at the festival for Caillee and Josie, and they even got to model them before I bought them. Both jackets are pink but Josie's is flashier while Caillee's is more sophisticated looking. Josie and Caillee received a million treats and well wishes from passer bys. Both had had pink thingees in their hair and every one made a comment about that. I guess it was good that they brought so much attention to themselves since no one managed to step on any of them. Well, everyone is back home and tired after a long and super, super hot day.